This new “magic in a bottle” product was launched in the salon at work last month and has been flying off the shelves! I’ve just gotten round to testing it out after Graham our lovely rep from Pureology dropped me off my own to try out! A first of it’s kind multi-tasking hair treatment spray to prime and protect being being for colour treated hair. Combining the exclusive AntiFadeComplex with Fennel Seed extract and a natural blend of camelina, coconut and olive oil, this leave-in hair treatment protects and strengthens for longer-lasting, perfect-looking colour everyday. It goes on damp hair before styling. Spray a few spritz, comb through and go about your normal styling routine. It smells nice, perhaps a bit too floral/fruity for some. The smell kinda takes me back to my early teens reminding me of the scents of The Body Shop, like Dewberry!!! I think this is a genius product and as all Pureology products the quality of ingredients are high and the results speak for themselves! All Pureology ingredients are 100% Vegan. This will definitely become a holiday “must have” for me this year as it’s an all in one multi tasking hair Beautifier you can’t go wrong with this thrown in your beach bag along with your SPF and Tangle Teezer! 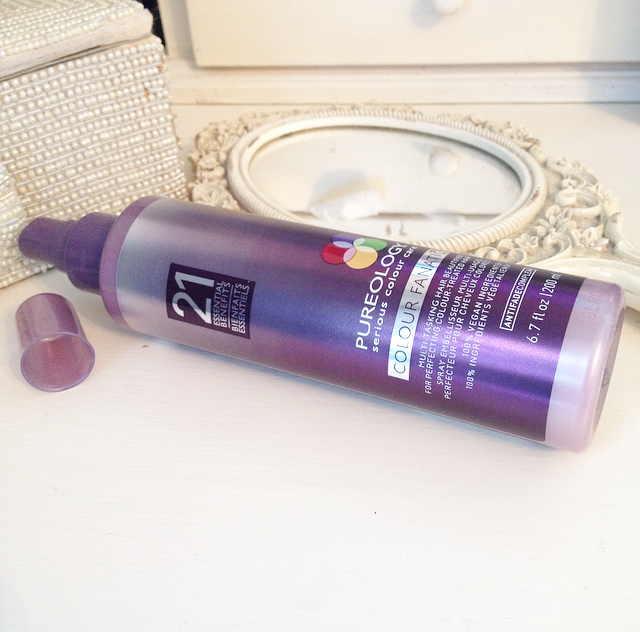 What Pureology products have become your must have hair care routine?